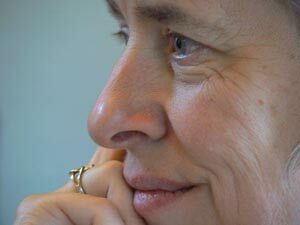 Ria Baeck, holding a master degree in Clinical Psychogy (KULeven) and living in Belgium, is a transformational change professional who has a rich background of experience and interests. She founded Vitis whose core purpose is to bring deep transformation in individuals, organisations and society. Her earlier work was in psychotherapy integrating the body in the process of healing. She is now a coach and mentor, who combines deep compassion, bodily awareness and a lust for life, to facilitate transformation in individuals, groups and larger systems. She trained in and worked with Systemic and Organizational Constellations, revealing the hidden dynamics in human systems and bringing them into flow again. The synergy of her different trainings and expertise gives her the skills to discern easily the origin of blockages in an organisation: in the realm of the relationships, in the organisational structure or in the individual. Because she draws on the mental, the emotional and the intuitive knowing, it often brings totally new and fresh solutions in a short time. This is Part Four of our Collective Presencing series. The earlier three articles in this series describe the new human capacity we are calling Collective Presencing. This article describes the journey to becoming a Circle of Creation–at least as far as the authors have travelled thus far, knowing that the horizon moves ever ahead as we take the next step. This is the first in a series of articles introducing the phenomenon and practice of Collective Presencing, a new capacity evolving in humanity at this time. Great thinkers have foreseen its coming—we recognise it in Aurobindo’s descent of the supramental and Teil-hard de Chardin’s noosphere. But what exactly do those terms mean? Where these gifted individuals intuited and envisioned the birth of this new collective capacity at the dawn of the last century, we are now starting to be able to describe it from experience. While many might recognise the phenomenon from transpersonal group work and other such practices, so far as we are aware, this is the first attempt to articulate it as a path and a set of capacities that can be intentionally developed.